Everybody’s favourite Woolworth’s vintage product! A pair of cereal bowls, price quoted is for the set of two! The wonderful iconic ‘Homemaker’ pattern was designed in 1957 by Enid Seeney for the Ridgway Potteries (Stoke-on Trent). The ‘Homemaker’ range, decorated with black stylised images of household items, is one of the most sought after and collectible china sets. 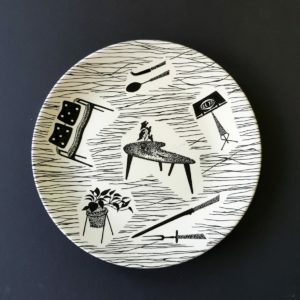 With its black and white design so typical of the era, it’s easy to see why this beautiful 1950s china is still so popular for vintage collectors today! We have other ‘Homemaker’ items listed on the site (see Tab below). If you wish to buy more than this pair of cereal bowls, please contact me to combine shipping!